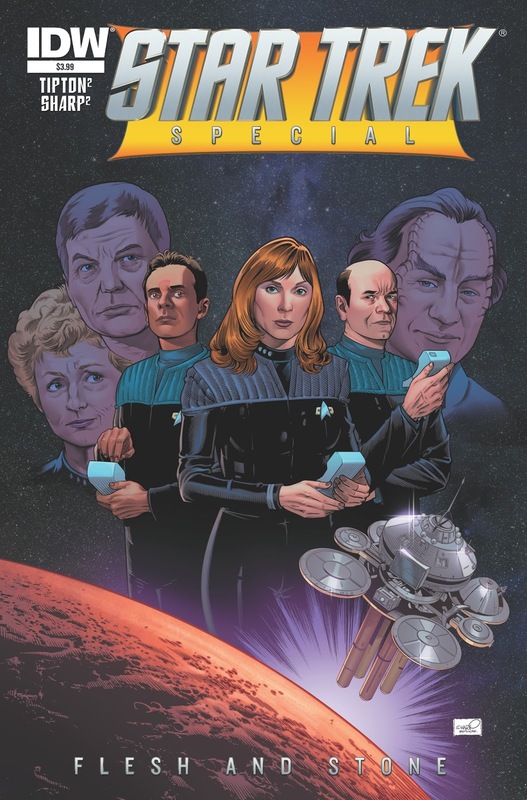 Out this week is IDW's first ever Star Trek Special, the one-shot comic Flesh and Stone, which will also be their first ever crossover featuring characters from all five TV series, with the story focusing on The Doctor (from Voyager), and Doctors Bashir, Crusher, Pulaski, McCoy, and Phlox. Doctor M'Benga and Nurse Chapel even show up briefly too. 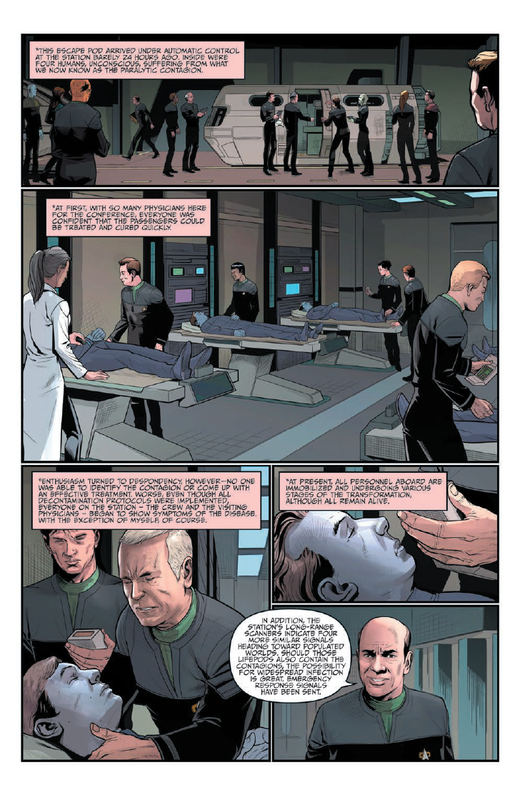 This medical crossover is brought to us by the Qualcomm Tricorder Xprize, so you can expect a certain piece of technology to play a key role in the story. 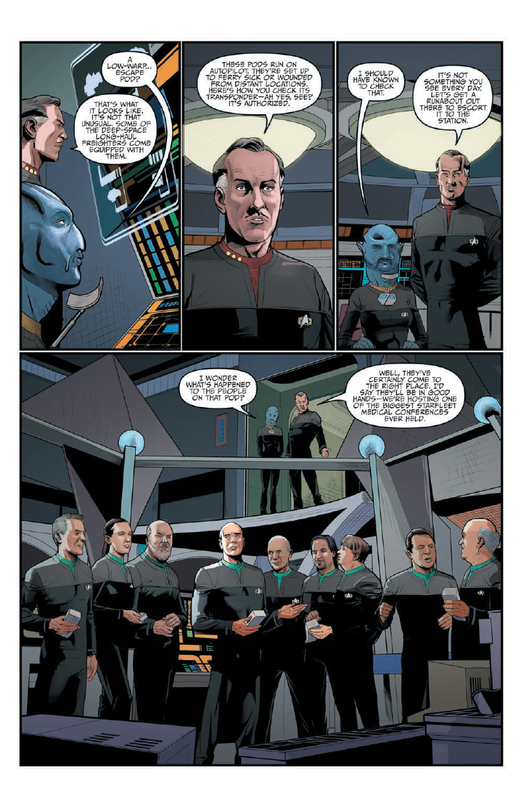 This story is significant in Star Trek publishing history for a few reasons: Phlox's appearance here marks the first time an Enterprise character has made a significant appearance in comics - There have been a few nods and references, and indeed Phlox himself appeared in a single panel as part of a flashback in one of IDW's earliest series, Klingons: Blood Will Tell, but this is the first time he's had any serious story time in Star Trek comics. 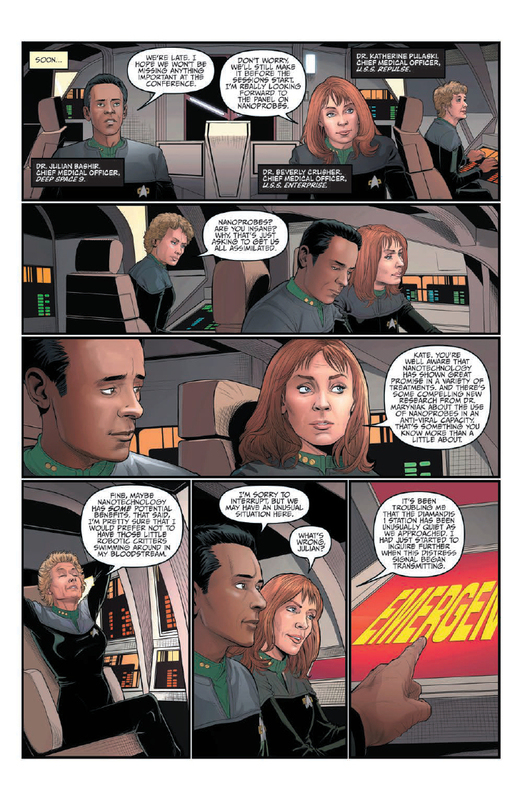 This might also seem to suggest something going on with IDW's Star Trek licensing arrangement. Previously they have only published TOS, TNG, and nuTrek comics, plus very briefly they had a go at a couple of DS9 stories. Now we have all the series involved in this crossover, and DS9 returning in the nuTrek crossover story, The Q Gambit. 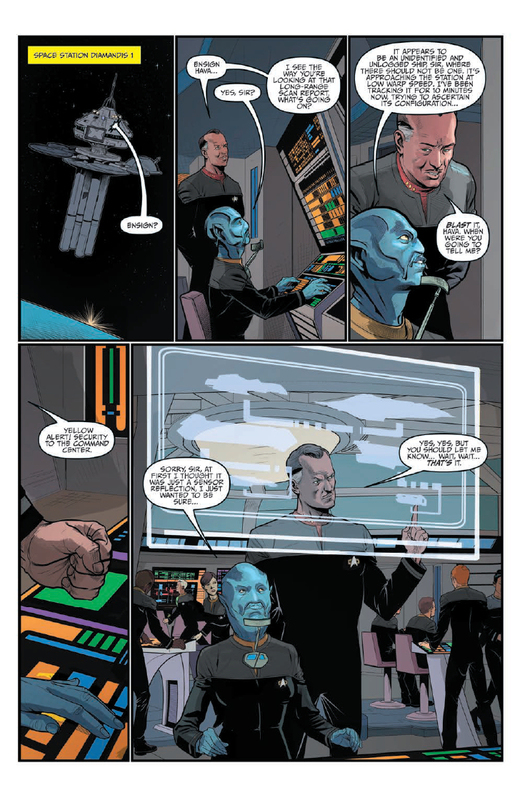 Of course characters from Voyager, DS9, and the aforementioned Phlox flashback have shown up in IDW comics before, so it remains to be seen if this is actually an indication of IDW broadening their licensing arrangements, or just some one-off atypically-significant cameos. This is also significant in crossover history. To the best of my recollections there has only been one other story to feature characters from all five TV series (managing four is relatively common, but five seems to have been a stretch too far for most other crossovers). That was Keith R.A. DeCandido's The Brave and the Bold, which not only featured the main five crews, but a whole host of guest ship crews too! 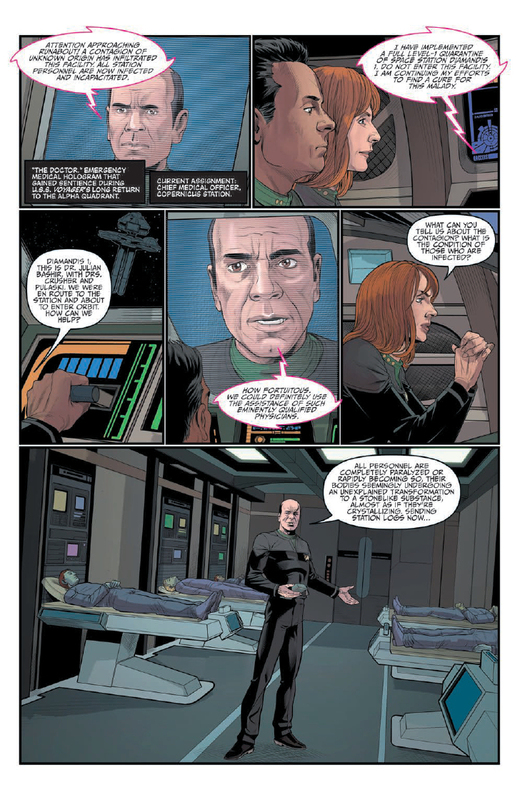 Also comparable is the short story Mirror Eyes, by Jeffrey Lang and Heather Jarman, from the anthology Tales of the Dominion War: Another medical mystery, with similar ambition to this new comic story, bringing together Bashir, Crusher, McCoy, an EMH (but not The Doctor), and making use of Phlox's logs. To continue reading, pick up Flesh and Stone at your local comic shop, or from online retailers like these: Amazon.com, Things From Another World, Forbidden Planet, iTunes.